Light a candle and let your personality shine through. 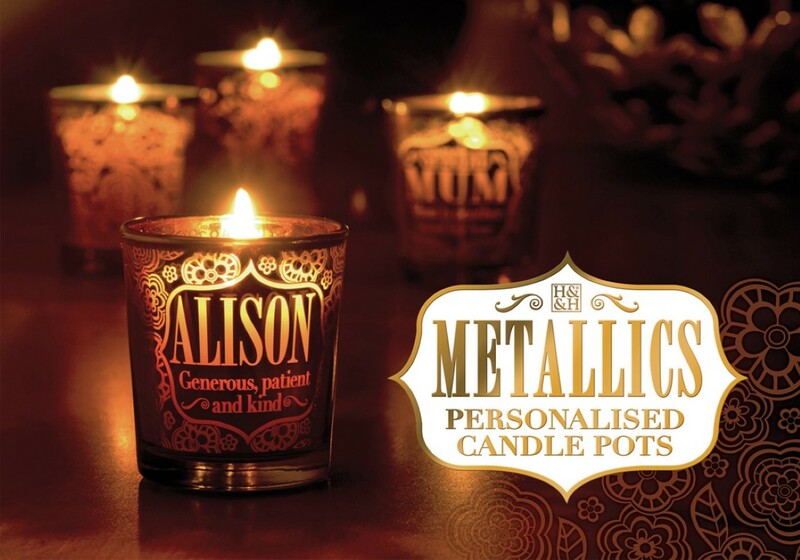 Our latest personalised range builds on the popularity of the fragranced candle market which continues to grow. 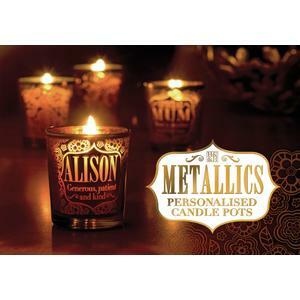 Attractive metallic candle pots and fragranced candles make the ideal impulse-buy gift choice. With 108 personalised titles, the pretty candle pots feature five delicate designs in a selection of four pretty metallic colourways, from rose gold to shimmering copper and silver. The metallic styling, both inside and out, makes for a truly eye-catching display but the delicate detailing is really shown to full advantage when a candle is added. The name and meaning literally shines through in the flickering candlelight. We also sell the scented candles that go in these candle holders so be sure to check out our ebay shop for more details. Linen, Cherry, Jasmine and Vanilla scented candles available.